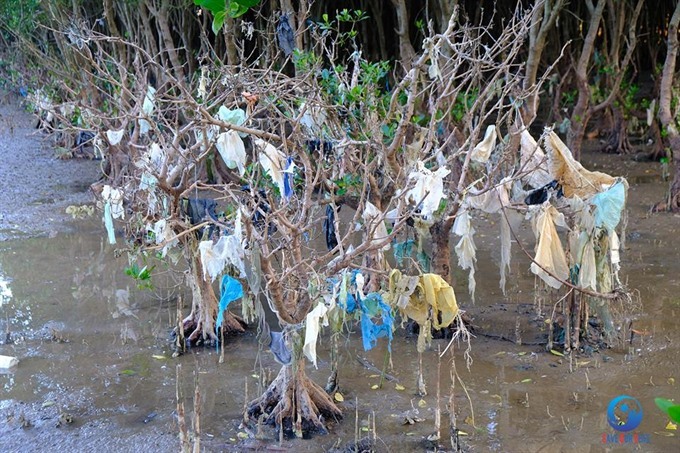 Plastic bags stuck on tree branches in a protective forest along coastal area of central Thanh Hóa Province. Numbers from Vietnam’s Association of Plastic illustrate the scale of the problem. In 1990, each Vietnamese consumed 3.8kg of plastic per year, but 25 years later, the figure hit 41kg. Nguyễn Thế Tuấn, head of Vietnam Administration of Seas and Islands, said the first priority was to review legal documents related to plastic waste’s risk management to complete legal framework on Vietnam’s ocean plastic waste combined with environmentally-friendly ocean growth strategy. Nguyễn Thượng Hiền, head of solid waste management department of MONRE’s Vietnam Environmental Administration said that MONRE aimed to reduce 65 per cent of non-biodegradable plastic bags used at supermarkets and shopping malls by 2020 compare to 2010. By 2026, Vietnam targets zero non-biodegradable plastic bags. According to Minister of Natural Resources and Environment Trần Hồng Hà, Vietnam has studied methods to apply technology in making environmentally-friendly materials from waste. Nguyễn Gia Long, director of Hydraulic Machine Ltd Company and waste-to-energy inventor in Vietnam said the technology could be applied in the community and follows global green energy trend and has low investment in device and equipment and helps cut spending on hiring staff thanks to automation. New Technology Company employs pyrolysis technology which uses heat to recycle plastic. Because plastic waste treatment and recycle sector plays a big role in environmental protection and renewable energy development, Nguyễn Thành Tài, director of New Technology Company, said the State should grant preferential policies to individuals and organisations to encourage them to invest in solid waste recycling.